DEUTZ, the innovative drive system specialist, has won an award for its DEUTZ Connect app in the internationally renowned Red Dot design competition. The 24 judges on the panel evaluated 8,600 entries from 45 countries before awarding DEUTZ Connect the prestigious Red Dot design prize. 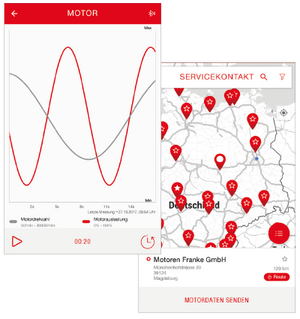 The DEUTZ Connect App is an app-based solution for mobile engine diagnostics. The accolade recognises the creative accomplishment and the excellence of the design. DEUTZ Connect is the first mobile engine diagnostic app for smartphones or tablets by DEUTZ. It displays all relevant engine data in real time, which can then be assessed using an intuitive user interface and transmitted directly to a service partner. The free app is revolutionising the service procedure for DEUTZ off-highway engines in the field. For the first time, operators of construction equipment, tractors and other machinery can access engine data and the fault memory in the field via Bluetooth and send this information to the appropriate dealer with a single click. This ensures that service procedures are fast and precisely targeted. Fleet operators can also use the intuitive app to manage their engines and to specify servicing windows, for example.